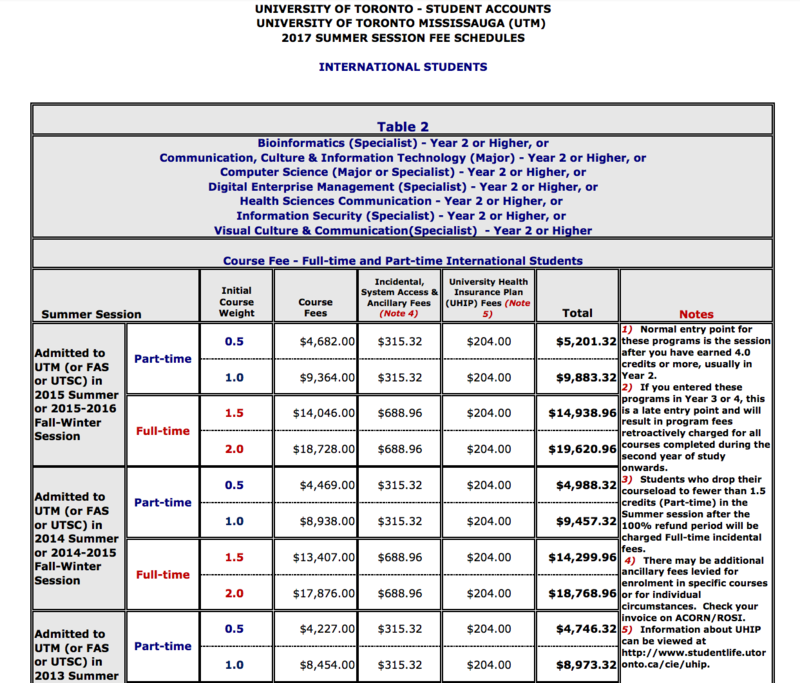 I’m a 4th year computer science major student in UTM, and I plan to take more than 2 credits this summer, but the fee schedule only have the tuition amount for at most 2.0 credits(like here http://www.fees.utoronto.ca/Assets/Student+Accounts+Digital+Assets/20165+Summer/20165+UTM+Intnl.pdf), what do I pay if I want to study for, let’s say 3 credits this summer? first of all, i’m assuming you’re an international student, since you linked the international student fees page in your question. if you are, in fact, a domestic student, please look at this link. …meaning that if you wanted to do, lets say 1.5 FCE’s in one semester (3 classes per term to reach a total of 3.0 FCE’s for the whole summer), you would need special permission from your registrar’s office. if you have already been approved for this, you will just need to look at the table you provided me and do a little math. to break down your academic fees, the PDF you attached indicates on the first page that all summer courses are charged per-course. in the table you’ll see that every 0.5 FCE costs $4,682.00, meaning that if you were to take 3.0 FCE’s, you’d have to multiply this value by 6, giving you $28,092. since you are a full time student, you would be paying full time incidental fees ($688.96) and then UHIP fees ($204.00) in addition to your academic fees. the math: $28,092 + $688.96 + $204.00 = $28,984.96. meaning that your fee totals (not counting any outstanding fees you might owe) will be $28,984.96. damn that’s a whole lotta dough. if you are ever unsure about fees, you can contact your registrar’s office and they will be able to breakdown your fees for you! ← there’s always next year!